The study of nonlinearities in physiology has been hindered by the lack of effective ways to obtain nonlinear dynamic models from stimulus-response data in a practical context. A considerable body of knowledge has accumulated over the last thirty years in this area of research. This book summarizes that progress, and details the most recent methodologies that offer practical solutions to this daunting problem. Implementation and application are discussed, and examples are provided using both synthetic and actual experimental data. This essential study of nonlinearities in physiology apprises researchers and students of the latest findings and techniques in the field. Vasilis Z. Marmarelis, PhD, received his diploma in electrical and mechanical engineering from the National Technical University of Athens and his MS in information science and PhD in engineering science (bio-information systems) from the California Institute of Technology. He is currently a professor in the faculty of the Biomedical and Electrical Engineering Departments at USC, where he served as chairman of Biomedical Engineering from 1990 to 1996. He is also Codirector of the Biomedical Simulations Resource (BMSR), a research center dedicated to modeling and simulation of physiological systems and funded by the National Institutes of Health through multimillion-dollar grants since 1985. 1.3 The Problem of System Modeling in Physiology. 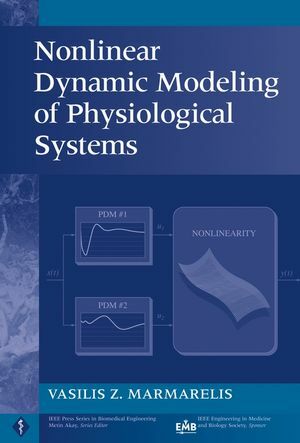 1.4 Types of Nonlinear Models of Physiological Systems. 2.3 Efficient Volterra Kernel Estimation. 2.4 Analysis of Estimation Errors. 3.1 Basic Parametric Model Forms and Estimation Procedures. 3.2 Volterra Kernels of Nonlinear Differential Equations. 3.3 Discrete-Time Volterra Kernels of NARMAX Models. 3.4 From Volterra Kernel Measurements to Parametric Models. 3.5 Equivalence Between Continuous and Discrete Parametric Models. 4 Modular and Connectionist Modeling. 4.1 Modular Form of Nonparametric Models. 5.1 Practical Considerations and Experimental Requirements. 5.2 Preliminary Tests and Data Preparation. 5.3 Model Specification and Estimation. 5.4 Model Validation and Interpretation. 5.5 Outline of Step-by-Step Procedure. 7 Modeling of Multiinput/Multioutput Systems. 7.2 Applications of Two-Input Modeling to Physiological Systems. 7.4 Spatiotemporal and Spectrotemporal Modeling. 8 Modeling of Neuronal Systems. 8.1 A General Model of Membrane and Synaptic Dynamics. 8.2 Functional Integration in the Single Neuron. 8.3 Neuronal Systems with Point-Process Inputs. 8.4 Modeling of Neuronal Ensembles. 9 Modeling of Nonstationary Systems. 9.1 Quasistationary and Recursive Tracking Methods. 9.4 Applications to Nonstationary Physiological Systems. 10 Modeling of Closed-Loop Systems. 10.1 Autoregressive Form of Closed-Loop Model. 10.2 Network Model Form of Closed-Loop Systems. Appendix II: Gaussian White Noise. Appendix III: Construction of the Wiener Series. Appendix IV: Stationarity, Ergodicity, and Autocorrelation Functions of Random Processes.